It’s been a big 12 months since these 2 incredible women joined the first SheStarts cohort here at BlueChilli. 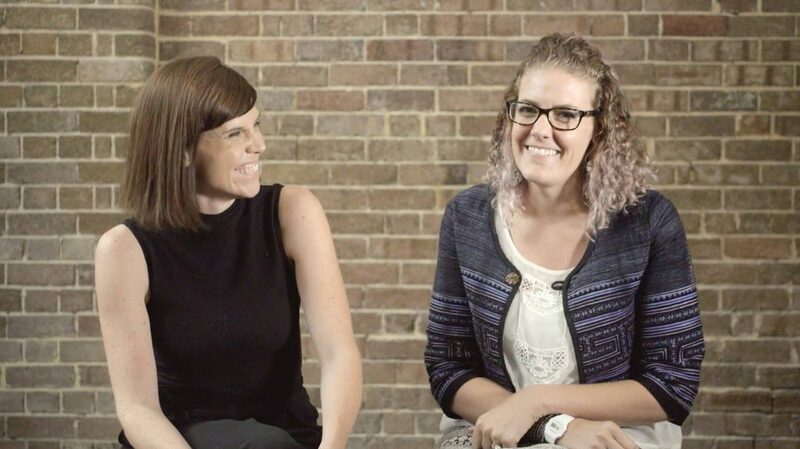 Jess and Lucinda, the co-founders of “Neighbourlytics”, caught up with the SheStarts program director, Nicola Hazel to tell us what they’ve been up to in the last 6 months since they finished the SheStarts accelerator and what’s in store for 2018. Well, I can’t believe how fast time’s going, I can’t even believe it’s 2018. We have had a rollercoaster since the accelerator finished in October — within a few weeks we launched our beta product. We had an MVP in the market during the bootcamp, then turned that into a beta, launched that in October, and managed to do the rounds of the conference circuitry in the property industry since then. And we were testing what parts of the property development market are most interesting in social data; what problems can we solve in that, so we can really focus the product from there. And that’s been the question on everyone’s lips — when do we seek investment and open our capital round — and we can’t do that until we know exactly what the target market is and the market opportunity. Only in the last few weeks, we’ve had huge clarity on what that is, and the retail sector has been a big growth area for us — lots of interest from shopping centres and economic development teams. Everything’s totally different to what it was in August. Well 12 months ago I was still living in Samoa, so just to think about what’s changed — it’s pretty massive. This year for me will be looking particularly at building our innovation impact. While we are investigating a whole range of different indicators for how we measure cities, the long game is really how we use that to build an industry-wide framework around measuring social change. Because that’s how we’re going to shift cities to become more socially sustainable. Recent news — finding out I’m going to be a Westpac Social Change Fellow in 2018, provides the opportunity to travel and meet with the best people in the world in that space, and to start building out what we think social sustainability framework can look like and how we use social data to measure cities in real-time. So while Jess is here as the CEO (building the company, getting those customers, getting ready for investment) you’re building the vision for the next rising of the company. That’s right, what we want to be able to do is understand that there is a burning conversation in property around socially sustainability. 10 years ago it was environmental sustainability, with groups (like green startups) who made huge progress in moving the sector forward that way. And now the conversation is about social impact, and I am excited that we’ve got the opportunity to not just get ahead of the curve, but to actually drive sector change, with a product that wasn’t previously available. Without social data, it’s very hard to scale the way that we measure and understand social change. And the interesting thing is our customers are asking for it. So we had thought that private sector clients would want to have their own customised thing. But that’s actually not the case, and we found that the industry wants to be led, they want to be told about these practices, they want to be leading the conversation around it. And that’s so exciting because of course, we need to be a business, there are commercial realities to what we’re doing, we’re not a non-for profit, and we need to be a sustainable business — but it’s really exciting that the industry expects us and want us to lead the charge in what social sustainability means, and it’s not just us trying to advocate for it, the industry’s ready. 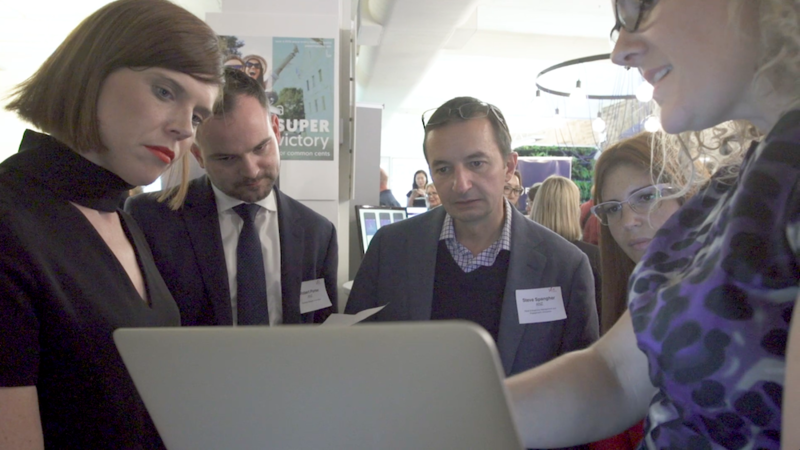 Lucinda Hartley & Jessica Christiansen-Frank presenting the Neighbourlytics vision at a SheStarts showcase in 2017. So there you go, 12 months ago, these 2 founders — one was in Samoa, one was running their previous consultancy in Melbourne. Here they now have a global tech company, already working with some of the biggest companies around the world, and they’re already thinking about “what’s next” for them. Where could you be in 12 months? If you’ve got an idea, why not just get started? Follow in the footsteps of these amazing founders, and all of the incredible women who are starting businesses at SheStarts.